​One of the products I have found by research that will help with toxin removal, Poisoning and so much more. It works fast....see the video below for the results and lab testing. Seagate is unusual in the health food industry because they harvest and process their own raw materials, including cactus, grapes and olive leaves. For the temporary relief for: difficulty breathing; sinus irritations; mucous blockage; swelling of mucous membranes; running or blocked nose; sinus pressure and congestion; accumulation of fluid. Dosage: Adults, use 1-3 sprays in each nostril every 2-4 hours or as needed. Children 3-12 years of age, use half the adult dosage. For children under the age of 3 years, consult a health care professional. Background: Natural antimicrobial products derived from plant sources such as this homeopathic remedy are proving to be potent preventatives and treatments, without the side-effects of modern pharmaceutical drugs. Natural products are less susceptible to potency loss as a result of mutation by the infectious germs because they are not created in a lab. Lab Testing: Seagate has tested this product for stability and potency at a major independent laboratory. In addition, a series of time-lapse tests were performed by the lab on a weekly basis introducing potent strains of bacteria (including Strep.) into this nasal spray liquid and testing the ability of the olive leaf nasal spray formulation to control bacteria colonies. In each test, all the bacteria colonies and all other microorganisms introduced were immediately killed. Baptisia (Baptisia tinctorial) has long been recognized as a homeopathic remedy because of its antiseptic properties. Its principal applications have been for mouth, throat and tonsil infections, inflammation and sore throat. Applications: Many prescription nasal sprays are composed of chemical ingredients in an alcohol base, which may cause a number of unwanted side-effects. 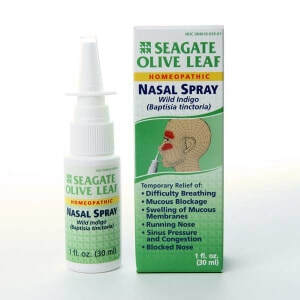 Seagate Olive Leaf Nasal Spray contains only all-natural plant-based edible ingredients that are antimicrobial and can be used for temporary relief for: difficulty breathing; sinus irritations; mucous blockage; swelling of mucous membranes; running or blocked nose; sinus pressure and congestion; accumulation of fluid. Get immediate relief for most nasal and sinus irritations, without the rebound effect of over-the-counter antihistamines. This is a natural product without side-effects that will help alleviate your nasal problems. Use it at the first sign of feeling sick, to wash away the fungi, bacteria, and other germs that may lodge in your nasal and sinus membranes before they can get established. You should also consider using this product before boarding airplanes, entering hospitals or schools … where you would be most exposed to contact with unfriendly germs. For prevention during the Winter season, use 2-3 times per day. For initial congestion and sinus irritation, use 2-3 times per day. For prevention when exposed to crowds or airplane travel, use before, during, and after contact.